Love Varnish: My Favourite, Elusive, Topcoat! Hi guys! It might sound a bit weird, but this post has been forever in the making. This manicure features a polish I have been wanting to show to you for ages, but I have never been able to get nice pictures of it. It just doesn't want to play nice with cameras! This has to be the 4th or 5th time I've tried to take pictures of it, and it's the best attempt yet, so I am finally showing you my all time favourite effect topcoat: China Glaze Shooting Stars! 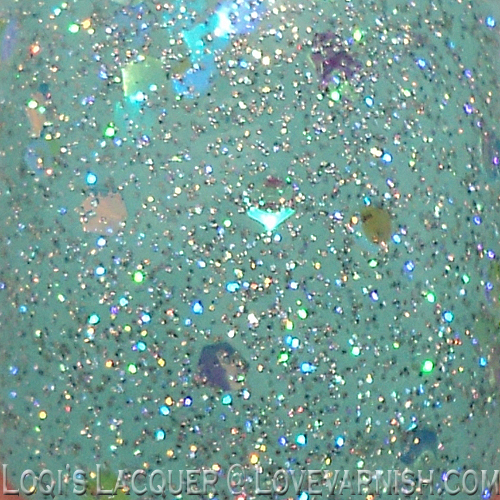 Shooting Stars is a holographic topcoat made of the tiniest holo particles mixed with large, iridescent glitter. The tiny particles look like a dusting of the finest glittering sand, so very pretty! And the large glitter seems to sink into the base polish, like it's part of the under- instead of the topcoat. As you can see in the unfocussed part of the last picture, the holo effect is really very strong, but it just doesn't show up right on camera. In real life this is polish is an amazing disco party on your nails! These pictures are 2 thin coats of Shooting Stars over China Glaze For Audrey, another one of my favourite polishes! I hope you guys like it and see you next week! Pictures taken in direct sunlight. This is a very pretty combo! I really love it.